The general purpose two-wire pressure transmitter is offered in two termination packages and provides contact level measurement up to 69' or 21.1m of water column. Select the -S_01 for cable termination or the -S_11 for conduit termination with an integral junction box. 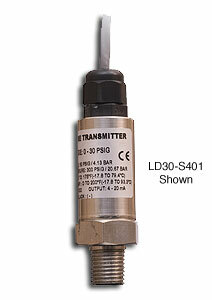 The transmitter is best applied with clean liquid or gas media including water, oil and air. Application examples include irrigation equipment, pumping systems and compressors.